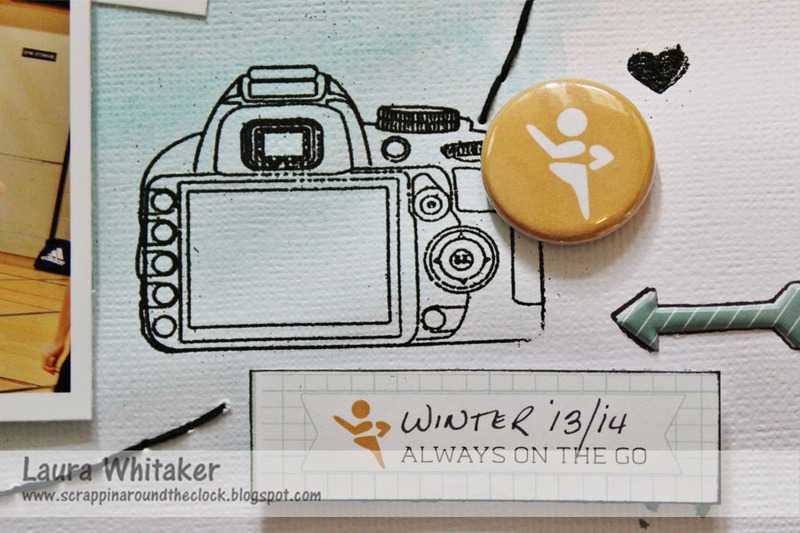 Laura here today, sharing a page that documents what our weekends look like during the fall and winter. For me watching our youngest play his sports is the best part of our chilly winter season. 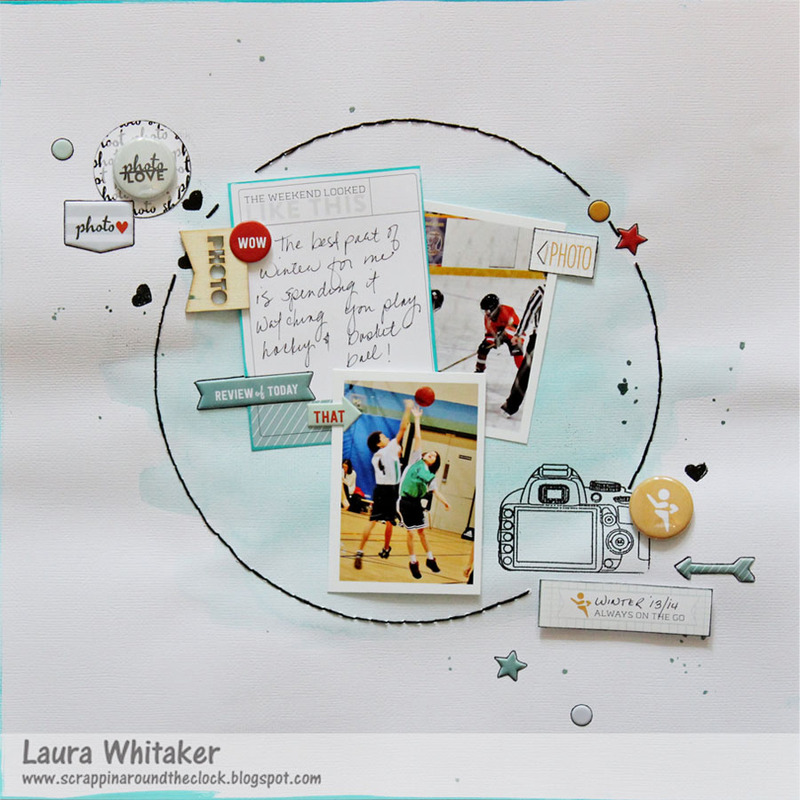 I started this page by adding a splash of watercolour paint to the centre, giving my page elements a base to 'pop' off of. I also added watercolour paint to the edges of my layout. 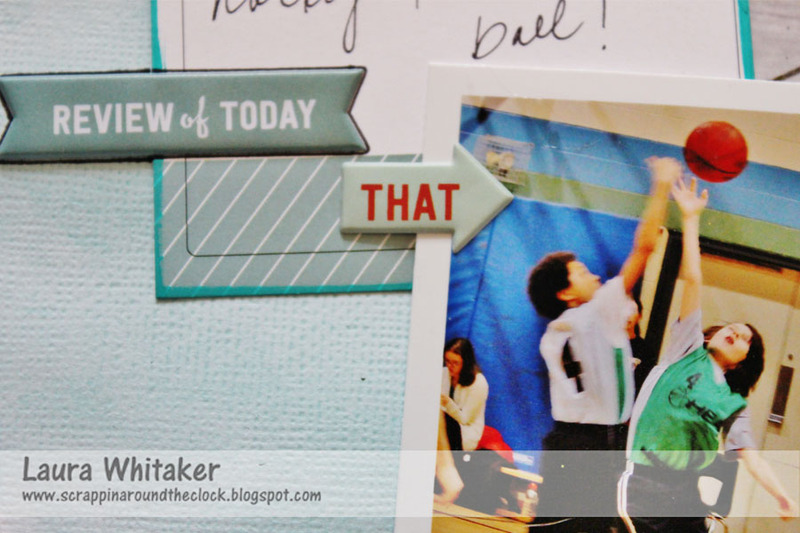 After centering my photos and the large tag for journaling, I got busy adding some fun elements. 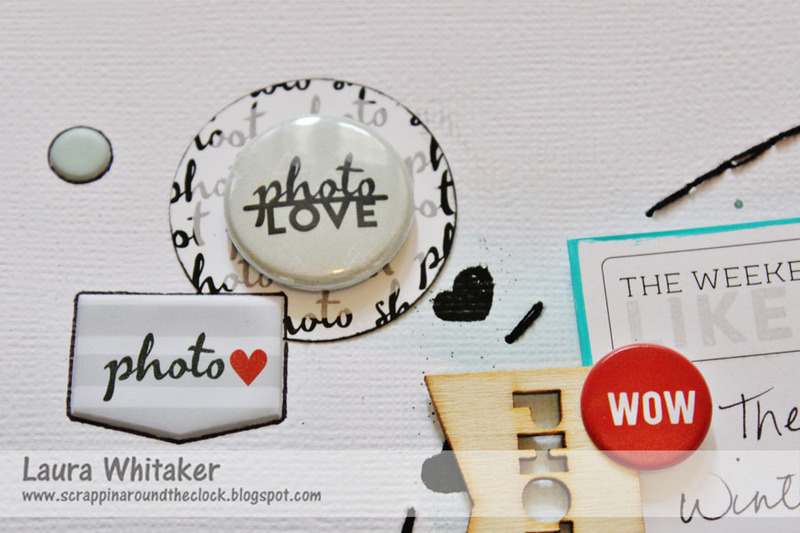 I stamped and heat embossed this camera image as well as several hearts. 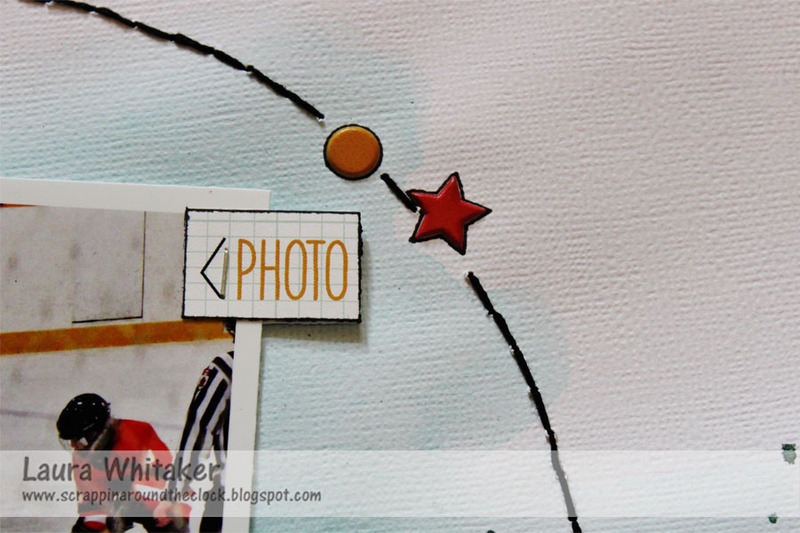 Both stamps are in the "Photo Shoot" clear stamp set, and are amazing! 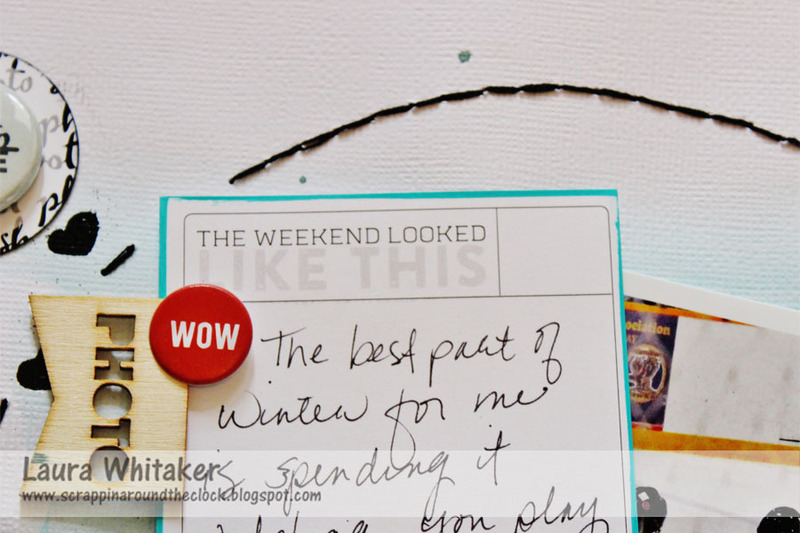 Next, I layered several embellishments in a few areas on my page. I love the way the traditional stickers, puffy stickers and badge buttons play off of each other. And having all these elements available in the "Photo Shoot" collection makes my page very cohesive. And let's not forget about the incredible wood veneer! I doodled around most of the puffy sticklers on my page, I like the way it makes them pop and makes my page feel more fun. Yes, I did use a ton of embellishments, I love that the collections are so full of goodies! But I still have loads left for more pages! Once I was finished embellishing my page, I added the stitching so that I could work my stitches around all the goodies on my page. Other Products: American Crafts Cardstock, DMC floss, Leow watercolour paints, Staedtler pen, Stazon ink. I love it! I'm quite envious of your water painting madd skillz.